A plaque commemorates the achievement of John McDouall Stuart and his companions on their successful south-north Expedition of 1861 -2. 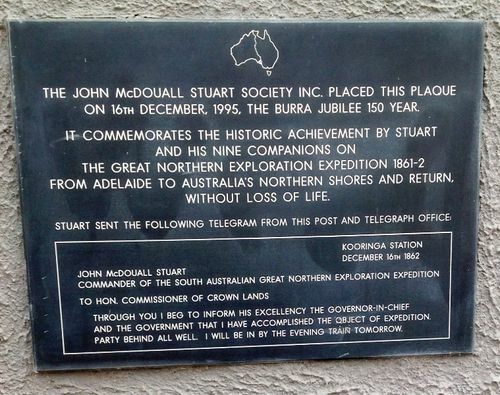 The plaque was unveiled in the Burra Jubilee 150 year at the site of the former telegraph station where Stuart sent a telegram confirming the success of his expedition. John McDouall Stuart officially set out on the 25th October 1861 from “Montefiore House”, the residence of James and Catherine Chambers in North Adelaide, on his sixth expedition. This was his third, and ultimately successful attempt to cross Australia. Nine months after leaving Adelaide, the British Flag (Union Jack) was raised on the northern shore at Chambers Bay, east of present day Darwin. The men and horses were weary from the nine months travelling, camping out in the open and surviving on severely limited rations and poor water. Stuart’s journal for the return contains a vivid record of his sufferings. The Expedition completed the first European crossing of Australia, from Adelaide to Van Diemen Gulf, passing through the Centre of the Continent, and returning along the same route without loss of life. Stuart telegraphed the news of his triumph from Kooringa (Burra) and reached Adelaide on 17 December 1862. Through you I beg to inform His Excellency the Governor-in-Chief and the Government that I have accomplished the object of expedition. Party behind all well. I will be in by the evening train tomorrow.